Leaked documents show Facebook making a radical departure from traditional online display advertising into a world where ads are conversations and brands automatically tell you which of your friends are already on their side. Facebook appears ready to launch a new set of premium ad units, and, based on a review of documents which purport to describe them, the social network would seem to be doubling down on two core principles that mark fundamental departures from traditional advertising. First, Facebook is making the new ads social by default, meaning they will automatically show users when their friends have already Liked the advertiser. And the new formats will draw their content exclusively from posts to brands’ Facebook Pages, rather from advertising copy written independently. Combined, these features make two statements about where Facebook believes the future of online advertising lies–at least in its particular universe. It is saying that ads based on content, rather than messaging, have a better chance of hitting home, and that ads involving tacit endorsements from the people you know have a better chance of capturing your attention. Facebook has not commented publicly on the new ads (presumably they will discuss them at a marketing launch event in New York next week). But the materials describing the new units were posted to Scribd earlier this week. The news was first reported on GigaOm. The documents are below. In the documents, Facebook says it is scrapping most of the display ad units it has offered until now, replacing them with the new formats. 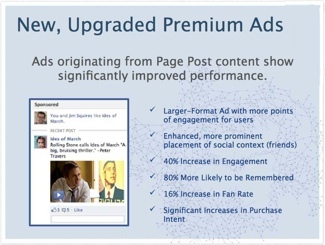 The previous ad units incorporated some of the social and interactive elements, but the new ones are implementing those features in a more comprehensive way. Each of the new units will include Like buttons and places for viewers to comment on the ads. When viewers click the Like button or enter a comment, those activities will be posted to the user’s friends’ News Feeds. They will also be posted to the brand’s Page. Similarly, each ad will include pictures of friends who have already Liked the brand. The Facebook documents say this will happen automatically, instead of as an add-on. While Facebook had already been moving in these directions with its previous ad units, the decision to draw ad content from Page posts is the most significant new feature–and a potentially radical departure from conventional notions of advertising. The ads don’t simply repurpose content from brands’ Pages. By giving users the ability to respond to the content inside the ad, just as if they had seen the content on the brand Page itself, and then by posting those responses to the user’s friends’ News Feeds, as well as on the brand’s Page itself, the ads are acting less like traditional broadcast advertisements and more like viral mechanisms to expand and perpetuate the conversation off into the far corners of the social network, effectively giving the brand visibility in places it might not otherwise have reached and in a much more organic way than if it had simply plastered the site with a bunch of banner ads. Facebook believes that this ultimately will pay greater dividends for brands than conventional advertising. According to tests the company said it performed internally, the new ads produce 40 percent more engagement (usually meaning they get more Likes, comments, and clicks) and are 80 percent more likely to be remembered. If the ads truly do deliver the results Facebook claims, that could mean the social network is slowly but surely finding the marketing holy grail of “word of mouth”–at scale. And if that’s the case, it could have profound implications for the advertising industry as a whole. The six new units are based on the type of content a brand would post to their Page. The Facebook documents label them as Status (a text comment), Photo, Video, Question (which replaces the old “Poll” ad format and which allows viewers to answer the question right in the ad), Event (ad viewers will similarly be able to sign up for the event right in the ad itself), and Link (which points viewers to content outside of Facebook). The Facebook documents say that brands will continue to be able to target their ads as they do today, choosing to place their ads in front of any of Facebook’s 845 million users who fit demographic and interest criteria selected by the advertiser.